In two previous post, here and here, we saw that the Bowtells ran various boot and shoe shops, both in and outside London, and we also found out that it is not always easy to tell which Bowtell ran which shop when. Father and eldest son were both named Thomas and were listed without the handy distinction of ‘senior’, ‘junior’, ‘the elder’, ‘the younger’ or somesuch. Or the shop was just listed for Bowtell & Co., which does not help. Anyway, I have tried to give an overview of all the shops in the post for 49 Skinner Street and that will have to do. 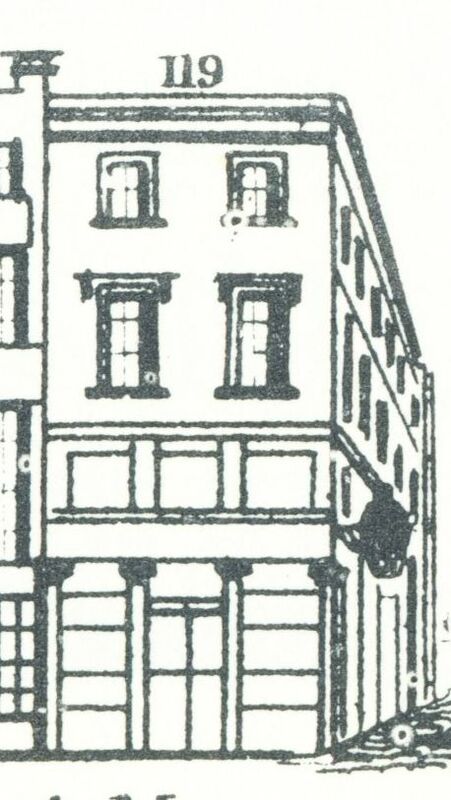 This post is about the Tottenham Court Road shop at number 152, which is first listed in March 1837 for Thomas Bowtell in a Sun Fire Office record. 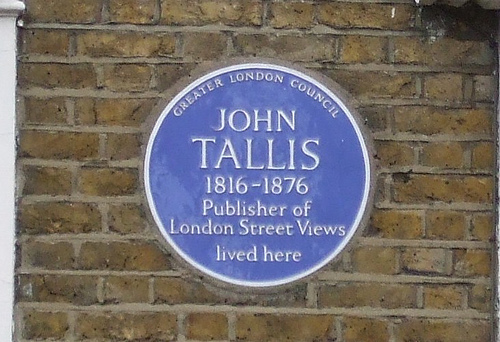 But an earlier Old Bailey case of theft shows that Thomas had a shop in Tottenham Court Road a number of years before he took out the insurance, although it may not have been at number 152. In July 1832, one John Rae is indicted for stealing a pair of boots from Thomas Bowtell “and another”. Rae apparently grabbed the boots through the open door of the shop, but the shopboy saw him do it and ran after him. Rae was caught with the boots in his possession, found guilty and transported for seven years. (1) This was, however, not the first time that Rae had attempted to steel boots from Bowtell. A very short transcription of another Old Bailey case saw Rae accused of stealing boots a few weeks before the other attempt, but this time he was found ‘not guilty’. (2) No indication is given what happened exactly, but Thomas Bowtell is recorded as saying “these boots were the property of myself and brother”, so we can deduce that it was Thomas junior who ran the Tottenham Court Road shop. 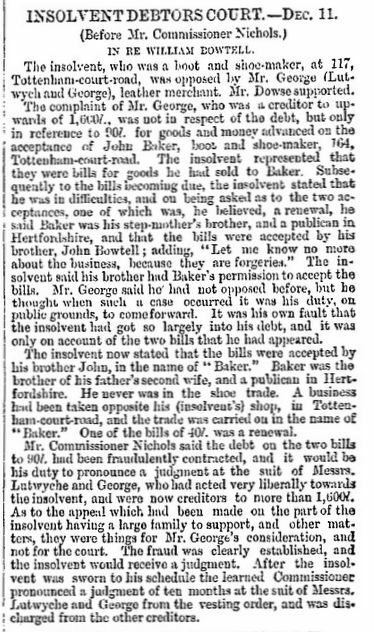 Yet another Old Bailey case helps to identify the brother as William, as in 1837 more boots were allegedly stolen and Thomas testifies that he is “a bootmaker, and in partnership with my brother William, at No. 19, Strand”. 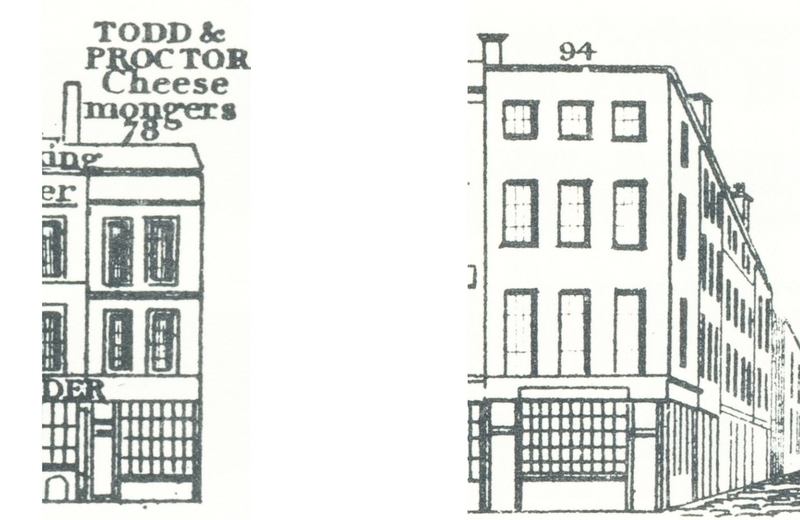 (3) In Robson’s 1842 Directory and in the 1843 Post Office Directory, the shops in both Strand and Tottenham Court Road are listed for T. & W., which must be Thomas and William. And at some point in time, the brothers ran a third shop at 42 Crawford Street, but on the 7th of January 1851, they dissolved their partnership.(4). The Tottenham Court Road shop is by then listed at number 117 and no longer at no. 152. The 1851 census shows William living at number 117 with his assistant Martha Wardley. 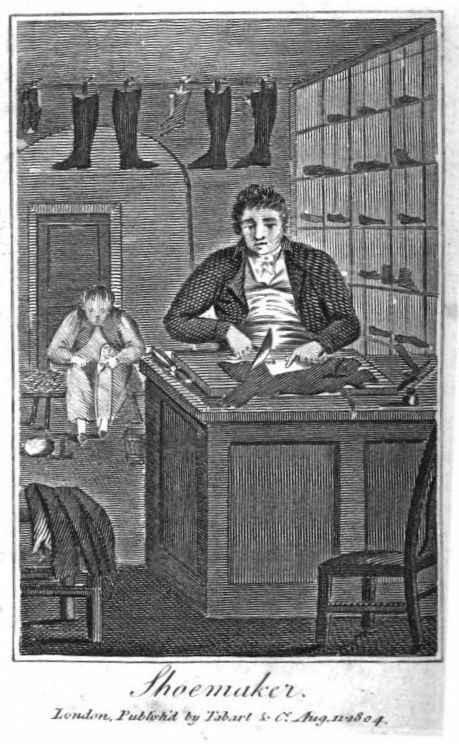 Thomas is then living at Portland Terrace and is described as master bootmaker, employing 6 men. But things did not go as well as the census appears to indicate, as in 1855, Thomas’s name is found in a list of bankrupts in the Debtor’s Prison and he is described as “formerly of no. 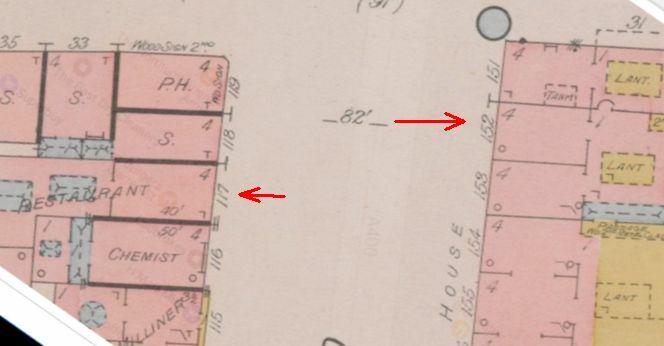 19 Strand, boot and shoe maker, having a private residence, first at no. 51, Saint John’s Wood, then at no. 4, Elm Tree-road, Saint John’s Wood, then again of some place, and next and late of no. 117, Tottenham Court Road, assistant to a boot and shoe maker”. (5) The 1856 Post Office Directory lists both 19 Strand and 117 Tottenham Court Road for William, so he seems to have come to the rescue of Thomas. But all these bankruptcies did not mean the immediate end of the business in Tottenham Court Road, as in the 1861 census, Thomas could still be found at number 117 as a bootmaker. Also living there as housekeeper is Martha Wardley, sister-in-law. It turns out that Thomas had married Mary Ann Wardley, Martha’s sister, but that was not the end of the family link as sometime between 1861 and 1871, William and Martha marry as well – a double family knot so to speak. Where William is in 1861 is unclear; perhaps still in prison? But by 1871, he could be found as a “shopman in the shoe trade” in Bristol. Living with William and his wife Martha are two daughters of Thomas, Ellen and Alice. Thomas, his wife Mary Ann, and some of their older children are living in Grange Road, Hackney. Fast forward twenty years to 1891 when William is retired, but still in Bristol. Thomas is also retired, but living at Mortlake Surrey at the Bootmaker Institute, also known as the Bootmakers Asylum. These almshouses were founded in 1836 and run by the Master Boot and Shoe Makers’ Association for the Relief of Aged and Decayed members, their Widows and Orphans, which later became the Boot Trade Benevolent Society (see here). The Bowtell emporium that father Thomas had so carefully built up, did not survive the next generation. John and Thomas went bankrupt in 1855, William in 1860, and Joseph thoroughly disgraced himself in 1857. (1) Old Bailey case t18320705-86. (2) Old Bailey case t18320517-141. (3) Old Bailey case t18370130-557. (4) The London Gazette, 10 January 1851. (5) The London Gazette, 12 June and 10 July 1855. (6) The London Gazette, 6 November 1860. 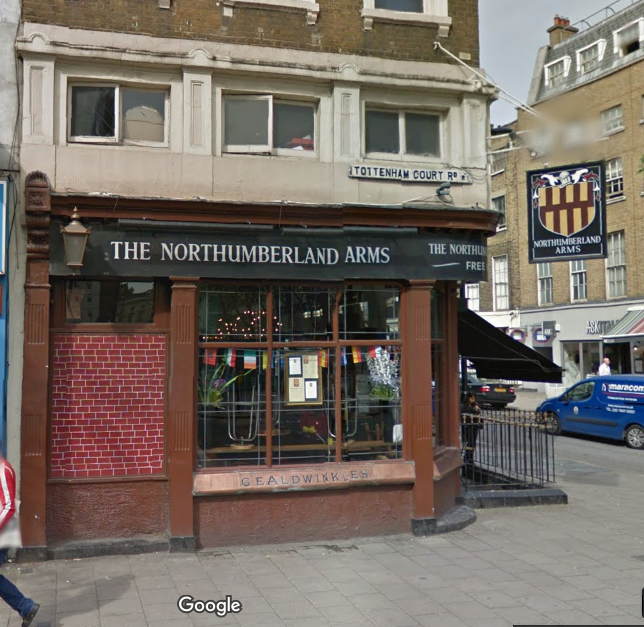 When writing this post, I quickly ran into trouble over a confusion as there are two Northumberland Arms in the Tottenham Court Road area, one in Goodge Street and one in Tottenham Court Road itself. The first one was often referred to as ‘in Goodge Street, Tottenham Court Road’, and just as frequently, neither was given a house number in the records, so it is perhaps understandable that confusion arose, not just with me, but with other researchers as well. 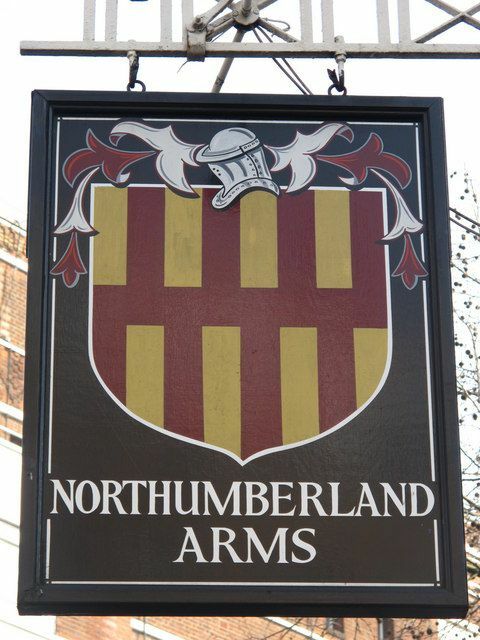 Having said all this, this post is solely about the Northumberland Arms at 119 Tottenham Court Road, corner of Grafton Street (now Grafton Way). In 1840, Nathaniel Whittock produced his On the Construction and Decoration of the Shop Fronts of London and plate 10 depicted the wine and spirit warehouse on the corner of Tottenham Court Road and Grafton Street. The illustration helpfully displays the house number 119, so no confusion possible in this case. is distinguished by having two stories converted into one, for the purpose of introducing immense vats, and likewise giving loftiness to the shop, which was formerly much too low to cut a splendid figure among the rival establishments by which it was surrounded: the effect at the present time is grand (if such a term may be applied to an erection of this sort) without being gaudy. From the baptism record of his daughter Ann, we saw that Rawbone started his career in 1816 as a schoolmaster, but by 1829 when daughter Elizabeth is baptised at St. James, Clerkenwell, he is listed as a victualler. On the marriage registration for his daughter Ann in 1846 he is listed as a brewer and a notice in The London Gazette of 13 August 1847 tells us that, in December 1846, Thomas Rawbone and Edward Hawks had dissolved their partnership as brewers at the Hollywood Brewery, Fulham Road, Little Chelsea. In 1851, on the registration form of his son’s marriage, he is listed as a wine merchant. Rawbone retired to Brill, Buckinghamshire, close to the Oxfordshire border, where he died in late 1856. 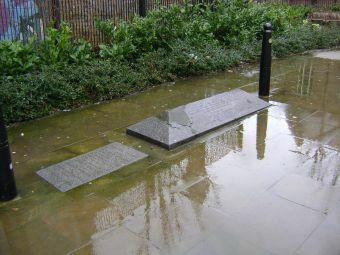 The fact that he came from Buckinghamshire and had property there helps us to narrow the gap in occupation of the Northumberland Arms between Humble and Rawbone as the 1837 poll books for Bierton with Broughton, Buckinghamshire, have his old address of Bath Place, New Road, London, crossed out and Grafton Street, Tottenham Court Road, handwritten above the original entry. The 1838 printed edition duly gives Grafton Street as his abode. This certainly suggests that Rawbone took over the Northumberland Arms somewhere in 1837, if not in 1836. In an 1834 list of members of the Licensed Victuallers Association he was still listed at the Adam and Eve, 20 Bath Place, so the uncertainty for the years 1834-1836 remains. 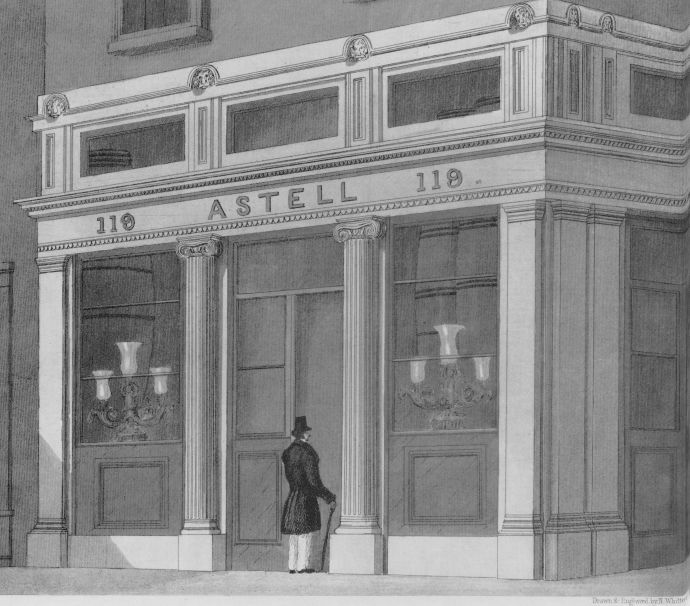 Perhaps Astell was the proprietor of the pub in those years, but perhaps not, and was his name an invention by Nathaniel Whittock. Perhaps we will find out in the future, but for now it has to remain a question, just as the name of person responsible for the renovation of the Northumberland Arms that so impressed Whittock will have to remain a blank for the moment. © Copyright Mike Quinn, reused under CC-licence. For original photo see here. For photos of the inside of the pub see their website here. (1) He can be found in the records of Cambridge University as admitted at Peterhouse in 1842. He became a deacon in 1846, a priest in 1847, and first served at St. Botolph, Bishopsgate, before moving to various other places. 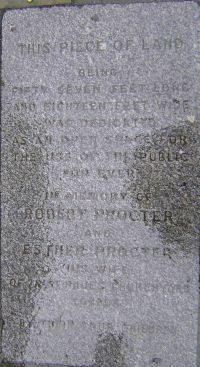 He died in 1884.